In the year of 1998 Ice Vinland made this record the first time, 7 songs of absolute power. 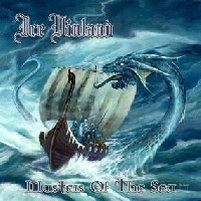 At the first listening you will feel like you are in the same room as Bruce Dickinson from Iron Maiden, to be honest the vocalist from Ice Vinland, Damian Leif Thorson has the same singing technique as Dickinson and are not afraid of imitating him, and the result is a vocal attack of dimensions that are sailing onwards as Masters Of The Sea. It's a little strange that the debut album from Ice Vinland are now re-released only in 333 copies, that sounds like a very small stack of CDs. It is worth a lot more, because the music is power metal, but it is special and traditional in any way, so maybe the answer comes as a fear of not selling so many albums. Life Of Illusions starts good and set a sample of their strength. The Faithless Prophets sweeps away the chair you're sitting on in one blow, this is power metal that makes everything fit together. Genesis Renewal has the quality of massive water coming to you too fast for escape. God Bless You is a good example of Viking metal going amok in blood seeking power metal, epical tale, metal like only few bands make it. Children Of Sin provides the melodic power metal that I like to hear, and again Damian Thorson sings just the way Bruce Dickinson are doing. Masters Of The Sea is not only the title song, also a special kind of metal that could be difficult to categorize, but it is super fantastic and fits perfectly into this 1998 album which breaks the borders again here in 2011.